Nixon in China. Air Force One touches down outside Beijing. Photo by Cory Weaver. 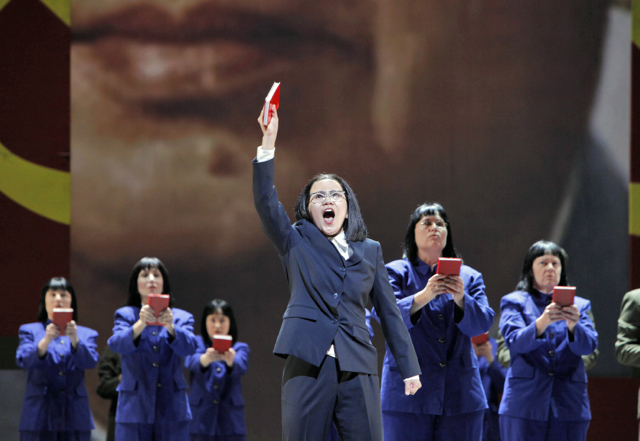 Perhaps the best aspect of the San Francisco Opera premiere of John Adams’ Nixon in China is in the ear of the beholder. Twenty-five years ago, at the Herbst Theater workshop, most of the music seemed to be coming from the pulsing ostinato hellhole of the worst of Glass and Reich. The majority of audience and critical response to the subsequent world premiere was similar to my own unfortunate initial reaction. Mea culpa. What poured out of the orchestra pit in the War Memorial tonight was an exciting, rich, memorable score, with thrilling harmonic resolutions, and invoking (but not, repeat, not copying) Wagner, Massenet, and Puccini. The score didn’t change, not much, but our hearing did, and we are all the richer for it. It helped immensely that under Lawrence Renes’ baton, the Opera Orchestra played as if possessed. In addition to the heroic, enduring strings, the woodwinds made a convincing case for the music. Renes, making his debut here, held it all together with such power and authority the composer himself hasn’t always demonstrated. Ian Robertson’s Opera Chorus similarly made itself proud, singing their demanding music with clarity and power. As if undertaking an extra challenge on purpose (or being at the mercy of the stage director), the chorus stretched out the entire length of the stage, and still sang as one, and with diction making the supertitles redundant. 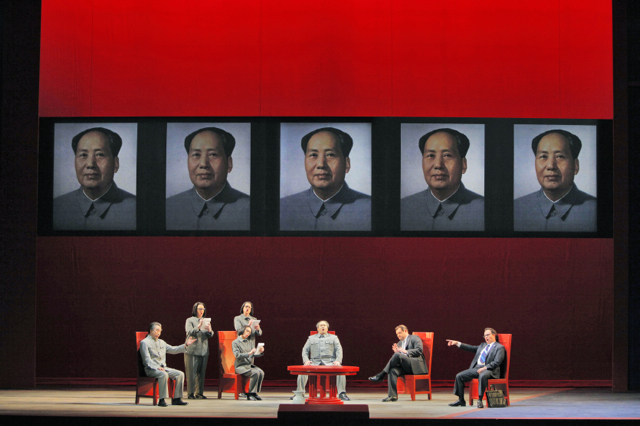 Chen-Ye Yuan (Chou En-lai); Ginger Costa-Jackson, Buffy Baggott and Nicole Birkland (Mao's secretaries); Simon O'Neill (Mao Tse-tung); Patrick Carfizzi (Henry Kissinger); and Brian Mulligan (Richard Nixon). Photo by Cory Weaver. Debuting Canadian director Michael Cavanagh’s work is superior to Peter Sellars’ original production. “Nixon” is more a triple bill than a three-act opera, each act complete in itself, with its own musical and dramatic style, related to the others only by sharing the cast. Cavanagh, instead of fighting the unusual structure, realized each “unit” in itself. He was assisted in a major way by Erhard Rom’s spectacular sets. 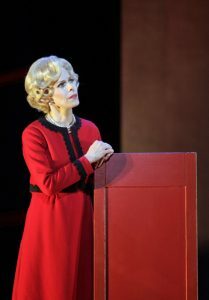 Maria Kanyova (Pat Nixon). Photo by Cory Weaver. 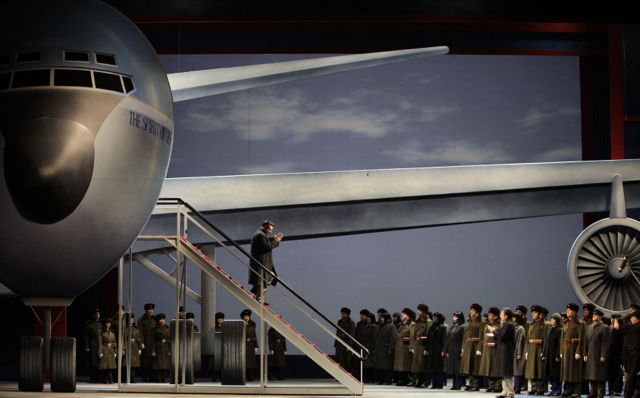 With an unusual decrescendo structure, “Nixon” opens with the “Aida”-sized Peking (not Beijing) arrival of Air Force One, going on to the big banquet scene. The second act is a feverish but surprisingly accurate recreation of “Red Detachment of Women” (Wen Wei Wang’s anguished choreography performed with some very determined dancers). The third act is a chamber opera, with the six main characters reminiscing about their past, the work ending on an ambiguous, haunting note. There might have been more outstanding individual performances in other productions, but this “Nixon” has the strongest overall cast. Brian Mulligan’s Nixon is vocally and dramatically (comically too) ideal. Maria Kanyova is an admirable partner as Pat Nixon. Simon O’Neill’s Mao, Chen-Ye Yuan’s Chou En-lai, and Patrick Carfizzi’s Kissinger form a solid ensemble of great soloists. The three secretaries – whose thanklessly undistinguishable roles resemble many a Three-Ladies setups – are Ginger Costa-Jackson, Buffy Baggott, and Nicole Birkland, each of whom should be heard alone… but they don’t get a chance. And then, there is the sensation of the evening, Hye Jung Lee, from the 2010 Merola Program, blowing down the house with her Chiang Ch’ing (Madama Mao), a huge, commanding voice and presence from a tiny frame. Read more about the production’s background in Georgia Rowe’s article, and don’t miss this production. Realistically and unfortunately, there will be plenty of tickets available. What took “only” a quarter century for many listeners – to really *hear* this work – may take more for casual opera-goers. Hye Jung Lee (Madame Mao Tse-tung). Photo by Cory Weaver. Editor’s note: Janos Gereben is a valued and trusted colleague based in San Francisco. His views, of course, are entirely his own. I will not be seeing this production, but I did see the Metropolitan Opera (Peter Sellars) production in New York last year and thought it was excellent. I also saw and reviewed the Long Beach Opera production in 2010 which, in many ways, may have been superior to the Met version. I regret having to miss the San Francisco Opera’s summer season, but Janos Gereben’s reviews of the upcoming productions will be posted here at Opera West. David Gregson.